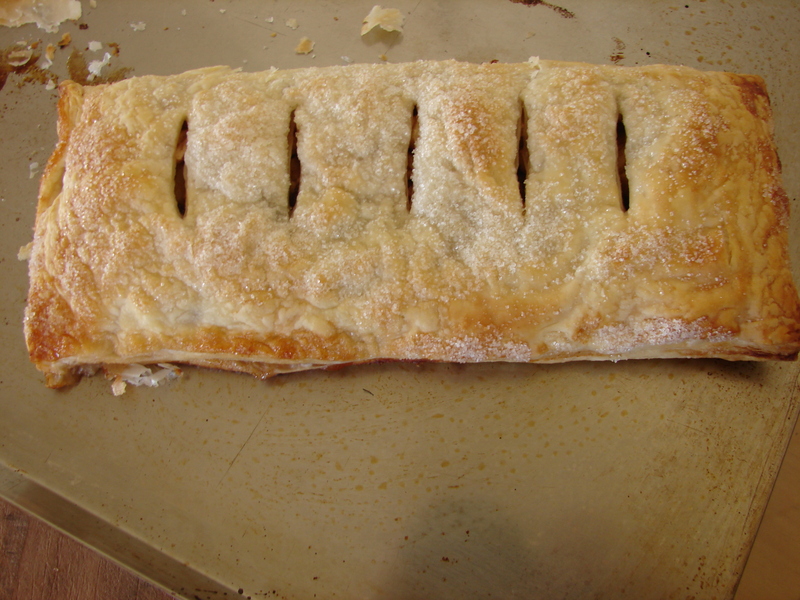 Apple Strudel is originally a middle European dish, most likely having originated in Austria. This recipe is not a true strudel but it is divine, and everyone wants more than one piece. I’ve used ordinary flaky puff pastry and relied on spices to make the most of the fruit. I serve slices of Apple Strudel for special Sunday morning tea, or take one steaming out of the oven for dessert when I have guests. It’s always amusing to see them eyeing up the remaining pieces. You don’t get any left over, that’s for certain. If you prepare Apple Strudel to the filled pastry point before baking, and then wrap it in Glad or Saran wrap, these yummy pastries will freeze very well. A word of caution – they must be fully defrosted before baking. If you can’t fully thaw before baking, bring the oven temperature down in order to cook the fruit without burning the pastry. 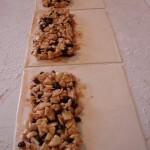 This recipe makes three Apple Strudels, of six pieces each. First peel, core and chop two apples, and stew them with as little water as possible, barely enough to cover the bottom of your saucepan. 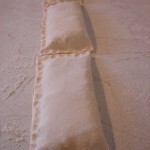 Next, sprinkle your working area lightly with white flour and lay your pastry out. 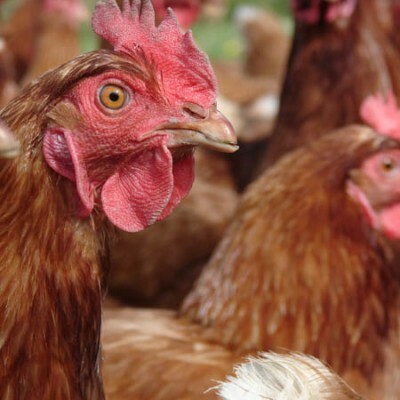 If it is frozen, it will have thawed enough to work with by the time you need it. Next peel, core, and chop the remaining apples finely into a bowl. By finely, I mean very small. This is a bit tedious but it results in the best filling. I take each quarter apple, slice it lengthwise twice so I have three pieces, and then folding all three pieces in my hand, with a good paring knife I slice across all three in a slightly thicker than shaved paring. 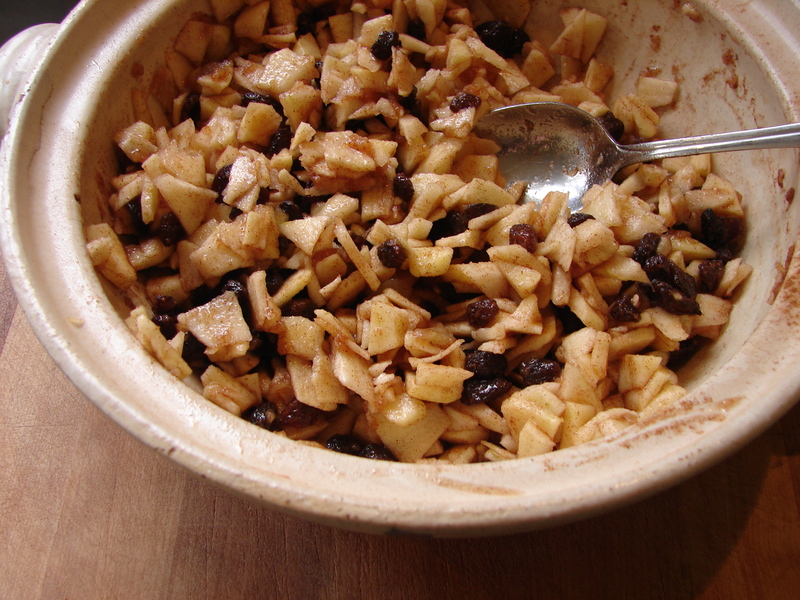 Once your apple is all sliced in the bowl, add the stewed apples. If there is juice in your stewed fruit, I recommend pouring it off. It’s a nice mouthful anyway. Now add the sultanas and cinnamon and ground cardamom and mix very well. I adjust my cinnamon to taste so I recommend a bit of experimenting but for the first time, two teaspons should be enough. Go very shy with the cardamom. You do not want to be able to pick the flavour of the cardamom out, rather it should be a subtle flavour backing up the cinnamon. Again, this is a matter of taste and you can experiment later. Now melt the honey with approx a tablespoon and a half of lemon juice – I do this for 20 seconds in the microwave. Mix the lemon/honey in with your apples and spices but if there is too much juice, keep a bit back. You really only want to ‘wash’ the mixture with the lemon and honey, not have it swimming, otherwise it will leak from the pastry and make a mess of your tray, as well as make it difficult to lift your strudel off the tray once it is baked. Now spread your fruit evenly over the front half of each sheet of pastry leaving at least a centimetre all round to stick it down. (See photos). 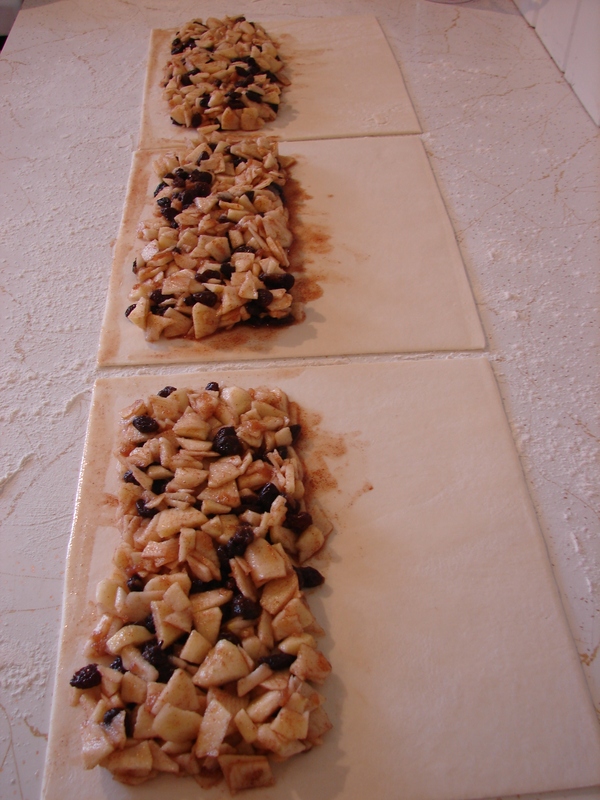 Once your fruit is nicely placed, wet the edge of the pastry with the leavings of the fruit mixture, fold the back half of the pastry up over the fruit and join it neatly to the front. 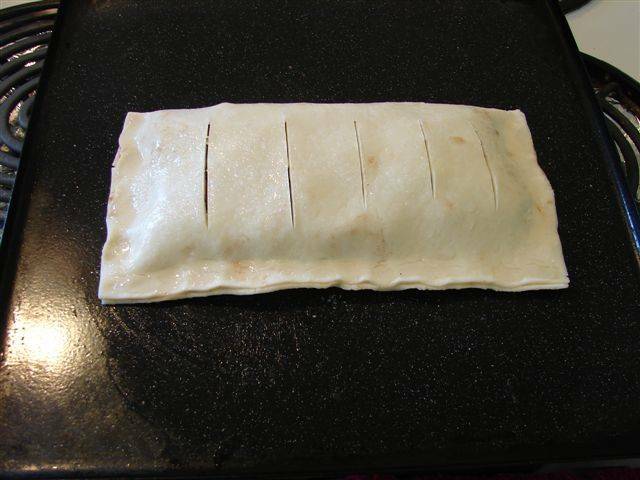 Crimp the edges with your fingers, keeping in mind that it is best if the pastry doesn’t leak. 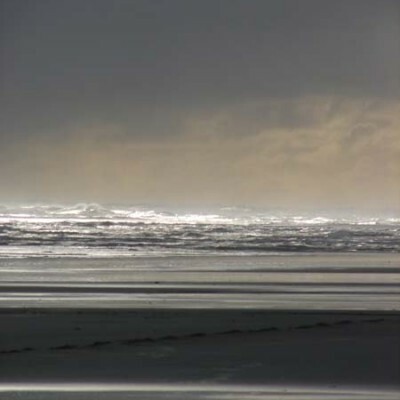 All is not lost if it does, so don’t panic, but it is better without leaks. If you are going to freeze any of your Apple Strudels, now is the time to wrap them in Glad or Saran wrap and lay them flat in the freezer. 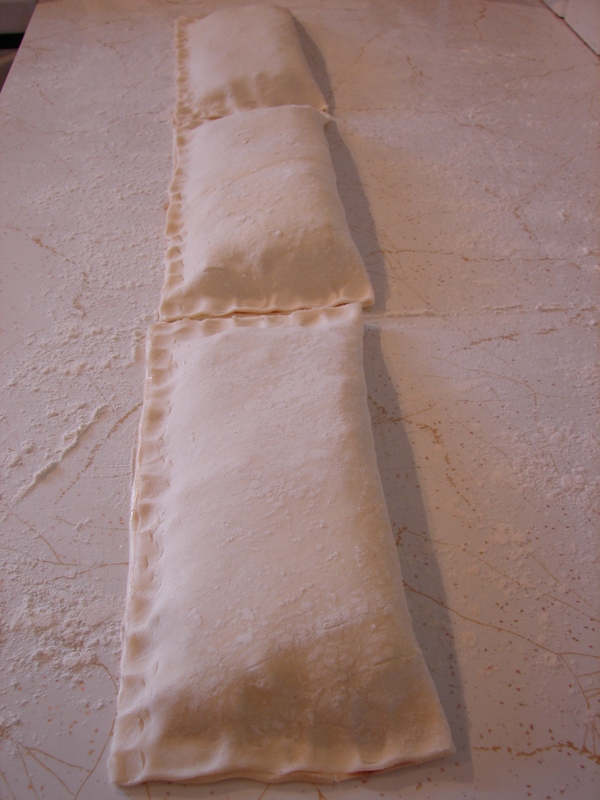 If you’re going to bake one or all of them, the next stage is to sprinkle sugar evenly over the top of the strudels and down over the stuck-down edges. 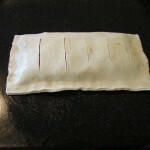 Make five slits in the top (see photos), place on a greased oven tray and bake at 180 for approximately 25-35 minutes. Apple Strudel (Apfelstrudel) is done when it is nicely browned on the top. Loosen the strudel carefully from the tray with a fish slice or broad knife. If the pastry has leaked you will have a burnt mass around the pastry on the tray. This easily melts off in hot water and the tray is not harmed by it. To serve, cut the strudel through the slits so you have six pieces and serve with whipped cream (if liked) and good coffee. Alternatively, slice it so that you have three pieces in total and serve with whipped cream or custard as a dessert. Guests love seeing this one come out of the oven – so fragrant, crisp, delicious looking. They’ll be back for more. I usually bake two if I have guests.